Viet Nam clinched the women’s sepaktakraw doubles gold in the Asian Games in Qatar on Wednesday, ranking 17th on the medal tally with three golds, 10 silvers and 7 bronzes. Viet Nam defeated Myanmar 21-16, 21-16 with their starlets Nguyen Hai Thao and Luu Thi Thanh confident from the start, displaying the fighting attitude that got them a victory over Japan in a semifinal. Myanmar’s Thin Kyu Kyu and Phyo May Zin, who passed their Chinese rivals in the other semifinal, failed to prevent the Vietnamese women from walking away with the gold in the event. Thailand later beat Myanmar 21-17, 21-15 in the men’s final, taking the gold. Wednesday was the last competition day for sepaktakraw in the 15th Asian Games. 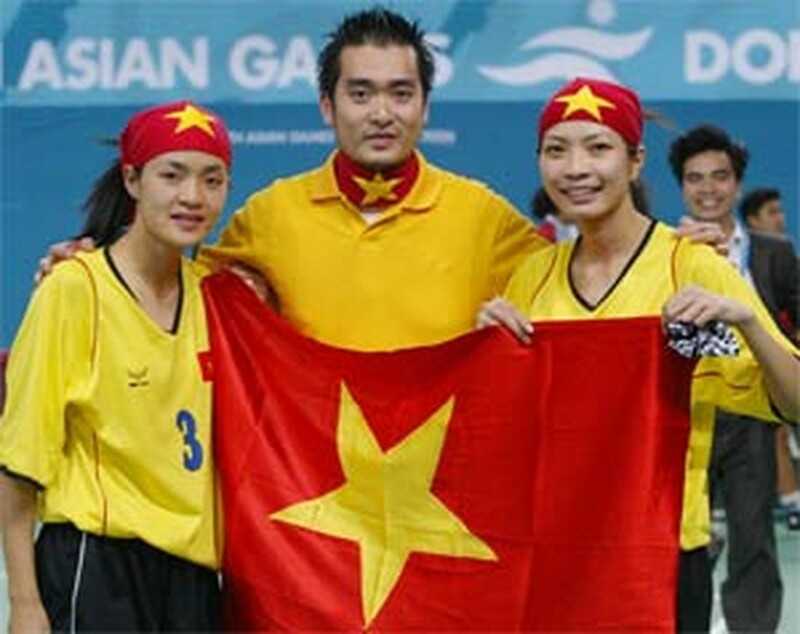 Vietnamese sepaktakraw women earned two golds and one silver for their nation, while men had no medals at all. On the same day, two Vietnamese men were qualified for the wushu finals. In the 52 kg category, Nguyen Quoc Vinh defeated Chanthra Khwanyuen of Thailand 2-0 and will play reigning world champion Catalan Rene Sornito of the Philippines in the final today. In the 65 kg category, Nguyen Duc Trung also secured a 2-0 win in a semifinal over Ali Maratab of Pakistan. However, he must today face a very strong player in the final – Zhao Guangyong of China, where wushu martial arts came from. In canoeing and kayaking, Tran Duc The, Nguyen Thi Loan and Doan Thi Cach competed in semifinals on Wednesday but none of them secured a medal.